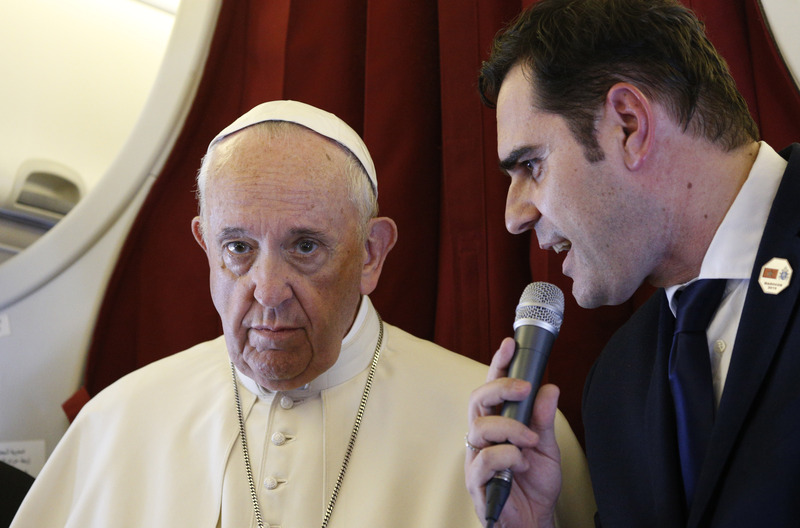 Pope Francis with Alessandro Gisotti, the interim Vatican spokesman, as Francis answers questions from journalists aboard his flight from Rabat, Morocco, to Rome on March 31, 2019. (CNS photo/Paul Haring). In what could be described as the leitmotif of his visit to Morocco, Pope Francis again emphasized the importance of building bridges in today’s world in a wide-ranging 45-minute in-flight press conference on his return flight to Rome. He spoke of this theme not only in relation to Christian-Muslim relations, but also to the plight of refugees and migrants in today’s world. Asked what he saw as the consequences for the future, for world peace and dialogue between cultures from this historic visit to Morocco, the pope said: “I would say that right now there are flowers; the fruits will come afterward. But the flowers are promising. I am content because in these two journeys [to the United Arab Emirates and Morocco], I have been able to speak about that which touches me so much in my heart: peace, unity, fraternity.” In February in Abu Dhabi, Pope Francis and Ahmed el-Tayeb, the grand imam of Egypt’s Al-Azhar, the highest seat of learning in Sunni Islam, used the opportunity of the pope’s historic visit to the U.A.E. to jointly release a statement expressing their hopes for world peace and greater understanding among religions. Pope Francis: "In every religion there is always an integralist group that does not want to move ahead and lives from bitter memories, past conflicts, and seeks even more war and sows fear." Pope Francis: "Dialogue cannot be made in a laboratory. It must be human, and if it’s human, it is with the mind, the heart and the hands." One reporter drew Francis’ attention to the fact that Spain has built wire fences topped with blades around two Spanish enclaves, and that President Donald J. Trump has recently said that he wants to close U.S. borders, and moreover wants to suspend aid to three Central American countries. What would Francis say to those rulers and politicians who defend those positions? He said he understood that a government can have “a hot potato in its hands” with such problems, but they must be resolved in a different way. He spoke of the fate of those who are sent back to their homelands or held in the prisons of human traffickers who sell the women and children and torture the men, and appealed to the European Union to show humanity. He recalled that when he discussed this problem once with the Greek premier, Alexis Tsipras, he was deeply impressed when the Greek leader said that “human rights come before accords.” That phrase alone, Francis said, merits a Nobel Prize. The pope said stopping abuse requires a multi-pronged approach, including prayer and penance, and that is why he asked the U.S. bishops not to vote in November 2018 on a new code of conduct for bishops and new procedures for handling allegations raised against bishops. Instead, he asked the bishops to have a retreat and wait until after the February summit to decide how to move forward. The laity and everyone else must be involved in ending abuse, he said, but “the church is not a congregationalist church. It is the Catholic Church, where the bishop must take control of this as the pastor. The pope must take control of this. And how should he do this? With disciplinary measures, with prayer, with penance, with self-examination. “We in the church will do everything to end this scourge,” he said. In response to a question about the many Muslim-majority countries where freedom of worship is respected, but legal or social pressures prevent Muslims from converting to Christianity, Pope Francis insisted freedom is a concept that grows over time. In fact, he said, there are still Catholics who strongly oppose the Second Vatican Council’s teaching on religious freedom and its insistence that even non-Christians have a right to follow their consciences. In many so-called Christian countries, he added, doctors and other medical personnel do not have a legal right to conscientiously object to euthanasia, for example. “Removing freedom of conscience is the first step to losing the freedom of religion,” he said. With additional reporting from CNS. What’s the objective? Sounds Pollyanna but is it? Maybe the Pope should articulate the reasons why one should be a Catholic? I never see this anymore. Seriously! Everything he says reminds us of our faith, and our responsibility to our fellow man. That is Catholicism! Moral and social teachings are what our faith is all about, and to pick and choose doesn't cut it. He speaks in humanist terms of what Francis speaks in spiritual terms. Is anyone listening? Vincent- Excellent article, thank you.